Aries I’m on fire. Can I run through your sprinkler? Taurus I just had to come talk with you. Sweetness is my weakness. Gemini Do you have any overdue library books? ‘Cause you’ve got the word “fine” written all over. Cancer Can I borrow a quarter? I want to call my mom and tell her I just met the person I’m going to marry. Leo Is it hot in here, or is it just me? Virgo Baby, you must be a broom, ’cause you just swept me off my feet. Libra If I had a rose for every time I thought of you, I’d be walking through my garden forever. Scorpio Your place or mine? Sagittarius Hi, I’m writing a term paper on the finer things in life. Can I interview you? Capricorn Have you always been this cute, or did you have to work at it? Aquarius You’re hot. You must be the reason for global warming. Pisces Are you as beautiful on the inside as you are on the outside? Posted on February 27, 2014 by ladyoftheabyssPosted in Articles, Book of Spells, Daily PostsTagged Astrological sign, Environment, Goo Goo Dolls, Hororscope, Kanni, Leo, LIBRA, overdue library books, Pick Up Lines, Population. Posted on February 5, 2014 by ladyoftheabyssPosted in Articles, Daily PostsTagged Calendar of the Moon Ash Tree Month Color, Coast, Environment, Environment Agency, Low-pressure area, Met Office, Rain, salt water, Tide, Wind, wind and water. So I might live my life with grace. Posted on February 4, 2014 by ladyoftheabyssPosted in Articles, Daily Posts, Prayers/invocationsTagged Activism and Peace Work, Christmas, Diwali, Environment, God, Israel-Palestine, Middle East, Munnar, Noise Pollution, Peace, Rush (band), Time, Warfare and Conflict. Posted on February 3, 2014 by ladyoftheabyssPosted in Articles, Daily PostsTagged Business, Climate change, Distribution, Distribution and Logistics, Environment, Management, Organizational Change, Transportation and Logistics. Altar: On a sea-blue cloth place a chalice of salt water, a skull, a dolphin, and a ship. Offerings: Paper ships. Deal with fearful emotions that threaten to drown you. Daily Meal: Fish or seafood. And draw us screaming into the darkness. And sometimes they fail us. By those terrible watery chasms. In any ocean, within or without. Born of water, cleansing, powerful, flowing, healing, we are…..
Posted on February 3, 2014 by ladyoftheabyssPosted in Articles, Daily PostsTagged Business, Drinking water, Environment, Salt, salt water, Sea, Seawater, water, Water Resources. Altar: Set with a blue cloth and lay upon it a great earthenware bowl filled with well water, in which are laid several crystals. Around it place a dipper and many cups, and a blade. Offerings: Secret offerings whispered into the cups and poured back into the bowl. Daily meal: Nothing to drink but spring or well water all day. Light, cold, raw vegetarian food except for fresh-water fish and crayfish. Posted on February 3, 2014 by ladyoftheabyssPosted in Articles, Daily PostsTagged AQUARIUS, Business, Environment, Racine Zoo, Suli, Sulis Minerva, Sulis Minerva Colors, Sulis Minerva Lady, water, Water Resources. Magick. We are all here to do magick. Call it what you will… spells, circle, ritual… it’s all magick. It’s all the same… high magic, low magic, candle, poppet, herb, and so on and so forth. Magick. In a nutshell: Magick is the ability to manipulate your surroundings within your environment, to manifest your desires, and protect yourself from outside unwanted energies. That is how I define magick. So, if we are going to manipulate our surroundings and our environment, don’t we need to be in a position to do so? Meaning, don’t we have to have our spiritual house in order? Is the true magician able to manifest his or her environment even if their inner space is in turmoil? Does magick require us to first have ourselves in order before anointing a single candle or casting a circle? Circle casting has a great deal of importance placed on preparation. Why is that? Is it about the tools, altar cloth, food, participants, the right moon phase, or even the right time of day and color? They are important factors to consider, but I feel they are adjuncts to the Magick itself, not the whole of the equation. We chose to pursue a belief system that has no rules per say but yet has numerous procedural protocols. Protocols are merely guidelines. Isn’t it about energy and intentions? The preparation starts way before we check to see what phase we are in or if Mercury has gone retrograde. The prep actually starts with that initial spark of a thought to cast, conjure, and manifest. I believe magick starts by challenging us to master ourselves. Being able to place our consciousness in another realm, another plane of existence is more than colors and oils. It’s magick; regardless of your practice — Gardenerian, Dianic, Wiccan, Luciferian, Thelemite, Asatru, to name a few — still at the core, it’s magick. The practice of manipulating your environment has to start from the inside out. All of the belief systems have varied circle/ritual celebration, spells, and different types of celebration. The belief systems start basically the same… meditate, and find yourself so as to not have doubt in your abilities, understand the path and purpose you are on before pursuing the practice of magick and attaining higher states of consciousness. Magick, in all its various forms, is all around us in everyday life. We are just moving so fast at times that we don’t realize or appreciate it. Some folks don’t even know they are doing magick in everyday life. Take for example church-going folk… they deposit a few dollars into the collection box, take a long match, then choose just the right candle, light it and then kneel and pray. They are empowering that light. They are transferring their intentions to the candle, be it for health, money, peace, or guidance. They are performing candle magick without knowing it. Does magick have to be ceremonial, with a full circle cast? If magick is the manipulation of one’s environment to manifest one’s desires, is blowing out the candles on a birthday cake after making a wish, magick? What about a coin in a fountain, blowing on a dandelion, a shooting star? I believe some will disagree, that to manipulate, to be able to manifest, starts within ourselves. Magick seems to be at work whether we are conscious of it or not. Vibes, intentions, desires, emotions… they are sent out from us every day in staggering volume. How many thoughts would you say you have in a 24-hour period? These emotions, intentions, vibes, and desire flow from us, both positive and negative. We sometimes don’t realize how much magick we do. When we cast spells, perform ritual, and/or commune with our Gods and Goddess, we are emitting energy. We are sending out vibes, intentions, desires, and energy that is emotionally charged. Sending up smoke, burning oils and incense, offering food and drink… all charged with our energy, our essence. Think about it. We should not just go through the motions, to perform a circle/ritual/spell (or whatever your belief system may do) . It’s not to just be “performed”; it’s the essence of the practitioner that envisions, builds, executes and completes the act of circle/ritual/spell. Magick requires a certain level of commitment. Magick is a living, breathing, consuming thing. Most all belief systems have some rules, mantras, or credo (for example, in the Wiccan tradition, the statement “in perfect love and perfect trust bide the Wiccan rede we must”) . How far does that go? What is that applicable to? Is it just for magick or everyday life? Do we light candles, cultivate herbs, dress our altars, cast our circle, have ritual and then turn that off? Is magick a ready-made thing? Just add water, break glass, needs no batteries? Or is magick and being a magician a lifestyle? My wife and I took some classes a while back and they where very informative but we were taken a back at the teacher and with the other people in the class. It was not what we expected. It was a coven atmosphere, there was a HP and a HPs during class and ritual. Almost everything seemed to be in its proper place — a general feeling of respect, reverence — but the gossip and petty drama that ensued was confusing. Perfect love and perfect trust? Karmic pattern? Three-fold law? Is it all just words? Magick, I think, needs to be a way of life. Not a controlling facet, but one that is integrated into everyday life, actions, words and deeds. Magick, I believe, is correctly executed when we mesh with the universe. Magic doesn’t have an on and off switch. Magick must flow uninterrupted, without obstacles placed in its way by us. Witches are not a rare breed. We were here long ago and shall endure the ignorance of others and their belief systems and persevere, prosper, and pass on our traditions. Being accomplished at anything takes time, patience, commitment, and practice. If you look at some of the most astute and learned people in any chosen field, notice a common thread: the path they walk, the call they answered, the vision they saw, is a lifestyle. It’s not a hobby; they are manipulating their own environment to manifest whatever it is they want. They perform magick. Posted on January 27, 2014 by ladyoftheabyssPosted in Articles, Daily PostsTagged Belief system, belief systems, Candle, Environment, Esoteric and Occult, Goddess, Magic, Magick, Pagan, Religion and Spirituality, Wicca. To guard against the thief and shade. This is a good protection spell, and can be performed every evening. In the morning, remove and dry the knife, and place it somewhere safe. Then, without touching it, pour the water outside, (or down the drain if necessary) and put the cauldron away. It probably wouldn’t be a good idea to do this spell if you’re expecting company, as it could be dangerous (and wet). You can do this at each door if desired, and protects against more than corporeal forms. Posted on January 27, 2014 by ladyoftheabyssPosted in Articles, Daily Posts, Protection SpellsTagged art, Athame, Cauldron, Energy, Environment, Knife, sharp knife, The Cauldron, water, Water Resources. 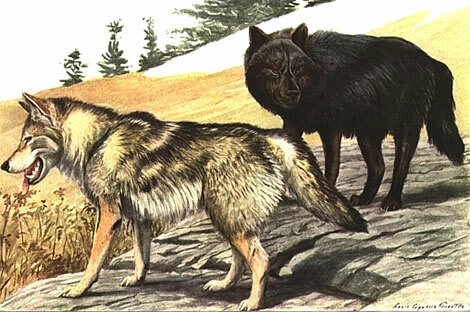 Posted on January 21, 2014 by ladyoftheabyssPosted in Articles, Daily PostsTagged Alpha (ethology), animal spirit, Environment, Gray wolf, Mammals, South Dakota, Wolf, Wolf of Wall Street, Wolf Wolf, Yellowstone National Park.